ASUSTOR NAS devices utilize high quality hardware such as Intel Core-i3, Celeron and Atom platforms that can offer premium stability and performance. 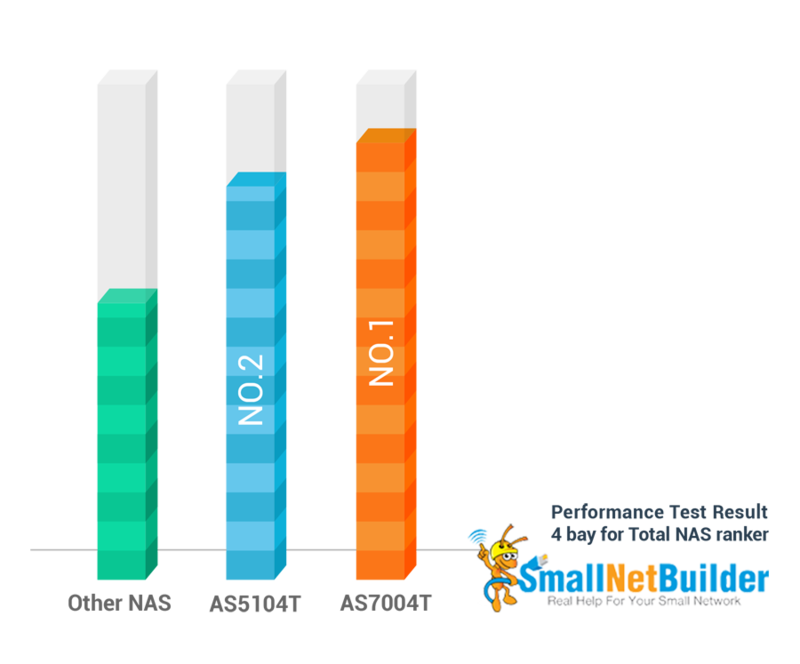 On the world-renowned NAS review and media website Smallnetbuilder, ASUSTOR’s AS7004T is ranked first overall for performance among 4 bay NAS devices. ASUSTOR’s AS5104 was ranked second. In addition to file read/write and transfer speeds, performance also includes smooth multitasking of applications, maintenance of stable system operation, an efficient cooling system featuring ASUSTOR’s exclusive smart fan system that controls the system temperature. All these factors must be taken into account when assessing performance. 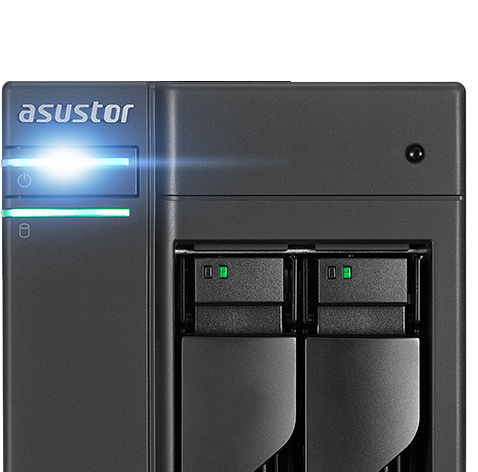 ASUSTOR NAS devices come in 2, 4, 8, 9, 10, 12 drive bay models. When selecting a NAS you should take into account the amount of storage space that you need and the RAID level that you wish to use. When creating a RAID 1 volume, a NAS with at least 2 drive bays is required (e.g., AS1002T, AS-302T, AS3102T, AS5002T). Creating a RAID 5 volume will require a NAS with at least 4 drive bays (e.g., AS5104T, AS6204T AS7004T, AS5008T, AS7010T). 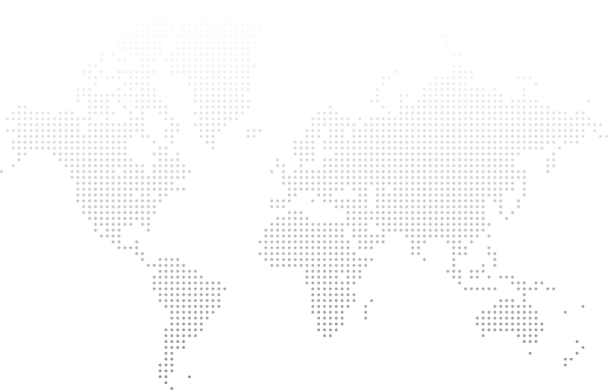 All ASUSTOR NAS devices also provide online capacity expansion and online RAID migration which helps users to effortlessly meet future expansion needs. 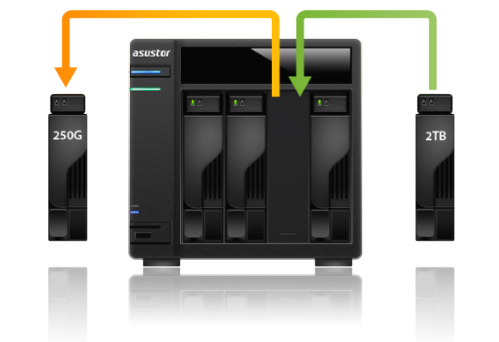 Furthermore all ASUSTOR NAS devices feature seamless system migration which allows users to take out their existing hard disks and insert them into a different ASUSTOR NAS system to enjoy instant access to all their data. This is extremely convenient when upgrading to a more powerful NAS. Whether or not a NAS has sufficient hardware expansion flexibility is very important to businesses. 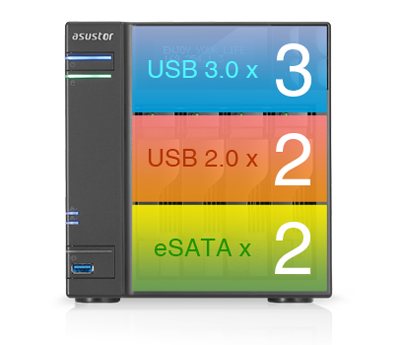 Different ASUSTOR NAS series feature different hardware expandability options and support such as USB 3.0/2.0, eSATA and LAN ports, expandable memory, or 10GbE Ethernet card support. For example, for ASUSTOR’s 5 series devices, the 2-bay and 4-bay models feature dual Ethernet ports while the 8-bay and 10-bay models feature quad Ethernet ports. ASUSTOR’s 50, 51, 61, 62 and 70 series devices also feature expandable memory while 7 series devices feature support for 10GbE Ethernet cards on 8-bay models and up. Models designed for use in the home such as the 2 and 3 series feature 3.5 mm audio jacks while the 5 series devices feature support for S/PDIF audio output. With regards to software expandability, all ASUSTOR NAS devices feature the exclusive App Central NAS App repository which features over 200 unique Apps. 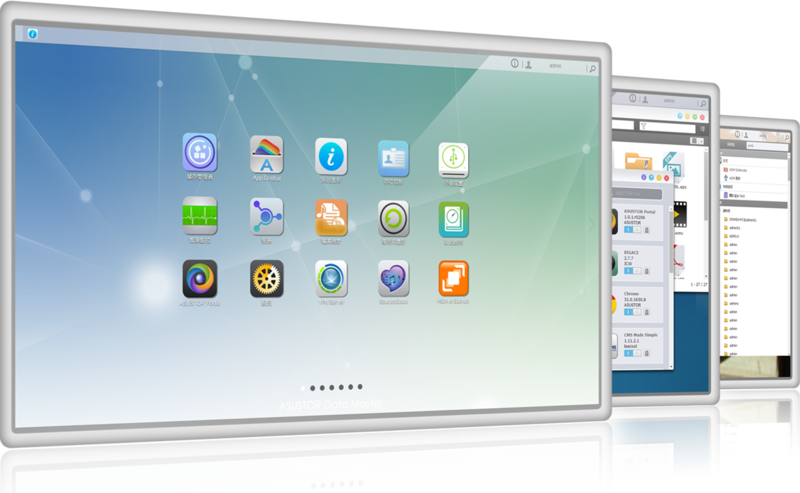 Users can download these Apps free of charge to add functionality to their NAS devices. 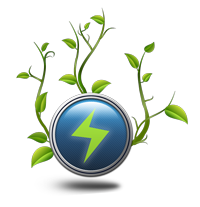 When selecting a NAS, the type of functionality provided by the should be considered based on individual needs. Examples of functions to consider include multimedia playback, surveillance camera management, Windows environment integration, cross-platform access, mail server requirements, VPN server requirements and more. Software and hardware expandability is important to consider and should influence your choice of NAS. The AS63/64 series supports next generation HDMI 2.0 specifications, featuring up to 60/50P resolution video which provides twice the fluidity of 30P. No matter if it's your treasured collection of Blu-ray quality movies or videos that you have recorded with professional quality cameras, ASUSTOR NAS can perfectly display all of it in crystal clear quality. Want to access the data on your NAS at any time, but worried that leaving it powered on for a long period of time will result in costly power bills, wear and tear on your hard disks and NAS or that you will become the target of hackers? ASUSTOR is the first vendor in the NAS industry to offer Wake on Wan support on the AS63/64 series easing all of the doubts mentioned above! WOW (Wake on WAN) allows you to enable all NAS services via the Internet, providing added flexibility for powering on/off the NAS. This allows you to save power, extend the life of your NAS and hard disks, and lower your chances of being randomly hacked, ensuring data security. 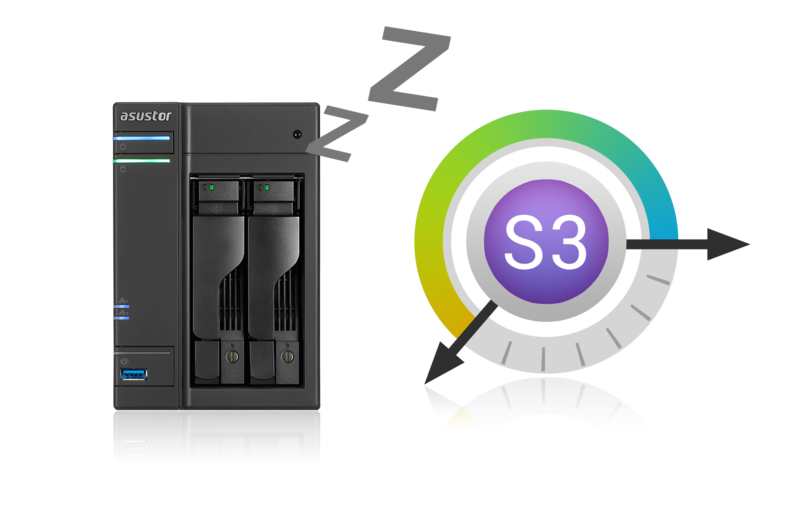 Although a NAS’s functions are based primarily on backup and storage, ASUSTOR NAS was designed with customizability in mind, providing a variety of functions via App Central that users can use to customize their device. For example, ASUSTOR’s unique HDMI hardware feature can be used in combination with ASUSTOR Portal and Multimedia App to turn your NAS into a dedicated digital entertainment hub. Users can also install Surveillance Center to create a surveillance system with video feeds that are viewable on their TV via HDMI. All this is possible and more with ASUSTOR NAS. ASUSTOR Portal: HDMI TV App that integrates ADM, Chrome Web browser surveillance feeds and more.